Somewhere lost in a timeless warp, where meaningful words use to be more appealing than texting or holding a conversation through the computer. Technology has made us lazy as we use social media and texting as a way to hold conversations when these things truly hinder the art of conversation. I remember living in a world where you would talk on the porch to family and friends for hours savoring the moments. In this new millennium technology has handicapped us from learning how to evoke meaningful conversations. I believe social media has disabled our younger generation because they lose themselves in social media without becoming social within the world around them. The biggest question to ask is how can we get back to the beautiful art of conversation with a social media and text induced world? The greatest way to tap back into the real world is log out from the virtual world. There should be a healthy balance of technology verses real life conversation. Real life conversations teaches us how to socialize with one another, it teaches us how to listen, pause and interpret someones words as well as body language. When we are holding conversations through text or social media we misconstrue what a person may say. 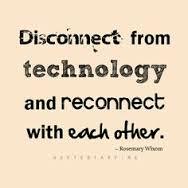 In order, for us to reconnect to realistic, meaningful & authentic relationships we have to be willing to unplug from social media and become sociable with the world around us. When we evoke intimate one on one conversations we are more fulfilled and happy in our lives. 1) Unplugging. Taking a digital detox from social media. 2) Reconnect. Making time to reconnect back to real relationships before social media became your primary outlet. 3) Vacate. Get out the house & meet new people. 4) Off Button. Turn off your phone for an hour or so to live in the moment & be mindful of the present. 5) Live in the moment. We miss out on intimate connections with the people we love because we share every moment on social media. Take some time to savor the moment & keep your memories secrete without sharing everything on your social media sites.